Crusaders manager Stephen Baxter is wary of the threat posed by a rejuvenated Linfield side ahead of Friday's league game between the sides. The Crues have not tasted defeat in the Premiership since losing to Portadown on the opening day of the season, while Linfield were unbeaten in December. Crusaders have lost just twice in 15 Premiership matches between the clubs. "The determination factor will keep rising with Linfield until they get a result over us," said the Crues boss. "If anyone told me at the start of the season that we would be eight points clear going into the New Year then I'd have taken that. "It will be a tough challenge for us at Windsor Park but we are looking forward to it and we will go there with confidence. "We must continue to work hard and we certainly won't be taking anything for granted," added Baxter. The Seaview outfit have won five of the last six league encounters against their cross-city rivals and are unbeaten in 10 previous visits to Windsor Park, a run stretching back to February 2012. Linfield, who were defeated 2-1 by the north Belfast side at Seaview on New Year's Day 12 months ago, lie third, nine points behind the champions, having played one game more. Elsewhere, Cliftonville signing Daniel Hughes will watch from the sidelines as his new side take on his old club Warrenpoint Town at Solitude. The second-placed Reds kept their title ambitions intact by coming from two goals down to earn a draw with their derby rivals Crusaders on Boxing Day. "Nothing is decided by the start of January and I have a great bunch of lads who have a great will and desire to better themselves every week, We have a wonderful spirit in our camp," said Cliftonville manager Gerard Lyttle. Glentoran travel to Stangmore Park to play Dungannon Swifts six days after going down 2-1 to Belfast rivals Linfield. "The pleasing thing for me has been that when we have suffered a setback like we did against Linfield, we have bounced back. As long as we continue to do that we will be ok," said Glens boss Alan Kernaghan. Ballymena manager Glenn Ferguson will hope to celebrate four years in charge at the Showgrounds by securing a favourable result against Portadown at Shamrock Park. The hosts have Michael Gault and Tim Mouncey serving automatic suspensions following their dismissals against Glenavon, while striker Gary Twigg hobbled off injured in the mid-Ulster derby. Coleraine ended a run of four defeats in all competitions by clinching their third win of the season over Ballymena on Saturday. Oran Kearney's side face Ballinamallard United at Ballycastle Road in the first of two meetings between the sides in consecutive weeks. 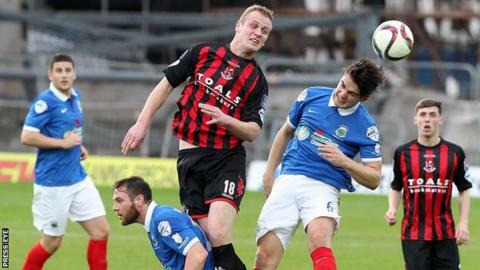 The clubs face each other again in an Irish Cup fifth round tie at the same venue on 9 January.